I love making holiday-related projects to give to family and friends. We often give family their presents at Thanksgiving anyway since we don't always see them at Christmas. This way they have the whole month to use it. This table runner can be definitely be made in any colors/fabrics for everyday or any holiday. My favorite part is actually the binding. I came up with the binding idea one night when I couldn't fall asleep. 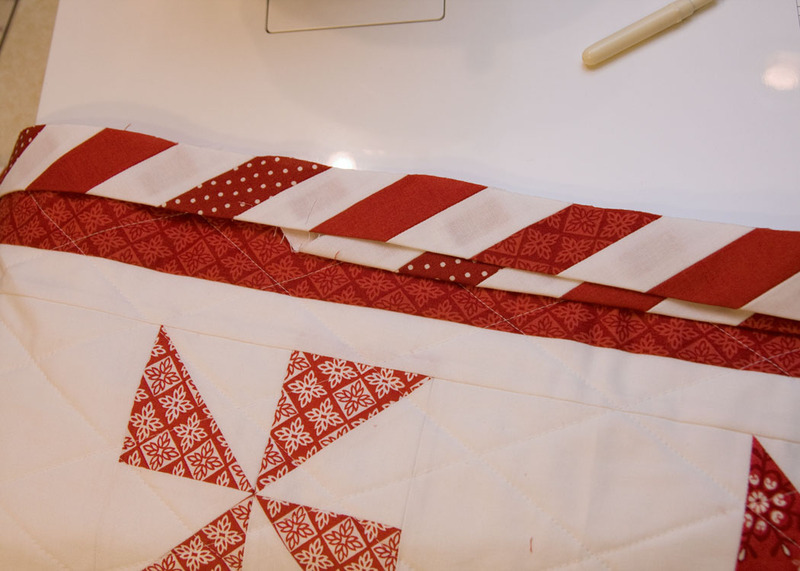 I loved the idea of the candy cane binding and actually designed the table runner around the binding. It's simple and a great beginner project. I left a lot of white space in the design leaving the option open for hand stitching and embroidery if that is your thing. (10) pairs of red pattern squares 3.5"
(1) pair of green squares 3.5"
(2) white strips 1.5" x 35.5"
(2) white strips 1.5" x 17.5"
(2) red pattern strips 2.5" x 37.5"
(2) red pattern strips 2.5" x 21.5"
Step 1: Make the pinwheel units. Pair each 3.5" pattern square with a white square. Mark a faint line between the diagonal corners and stitch a seam 1/4" from either side of the line. Slice the fabric down the line. Press seams (I prefer to press open). Trim each unit to a 3" square. Pair the matching sets of half square triangle units and piece into a pinwheel. Make sure all pinwheels are oriented the same direction. Sew the pinwheels with the 5.5" white squares in the arrangement shown. Step 2: Add the borders. First sew the long sides of the white border then the short sides. Repeat with the red border. Step 3: Make the candy cane binding. Trim one edge of each strip to a 45 degree angle. Sew strips together, alternating white and red. Offset slightly as shown in second picture. Use a slightly smaller stitch length. Press all seams open. Trim edge of pieced section ensuring it remains at a 45 degree angle. 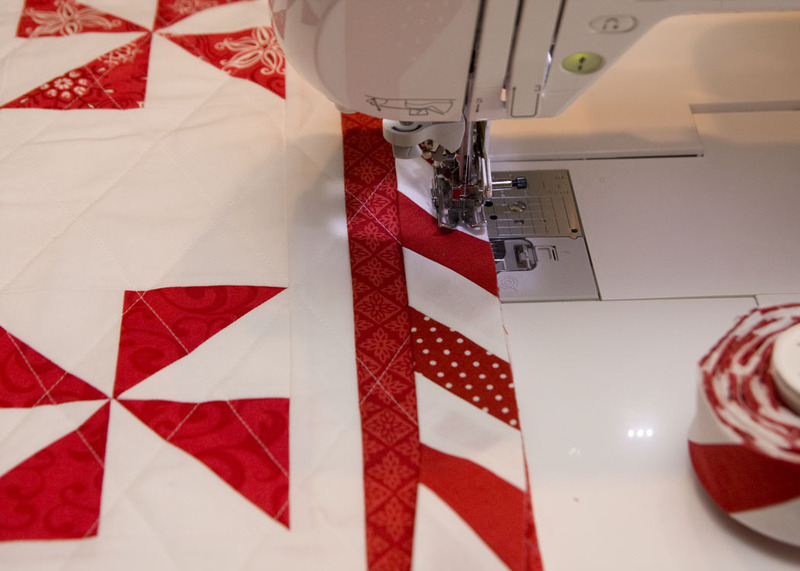 Cut all pieced strips to your desired widths. A standard binding is 2.5". I chose to cut mine slightly wider at 2.75". Stitch strips end to and and press binding in half. 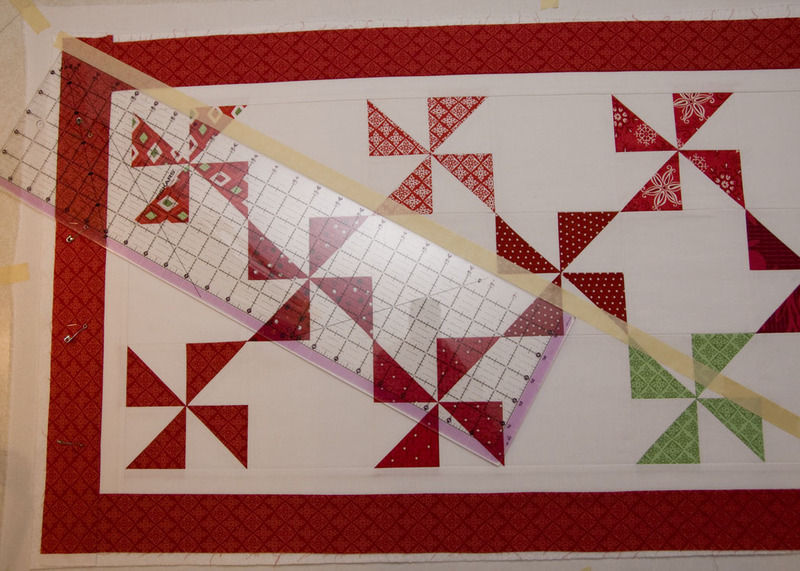 Step 4: Baste the table runner and quilt as desired. I chose to quilt my lines at a 60 degree angle from each direction. I marked the initial line using masking tape. 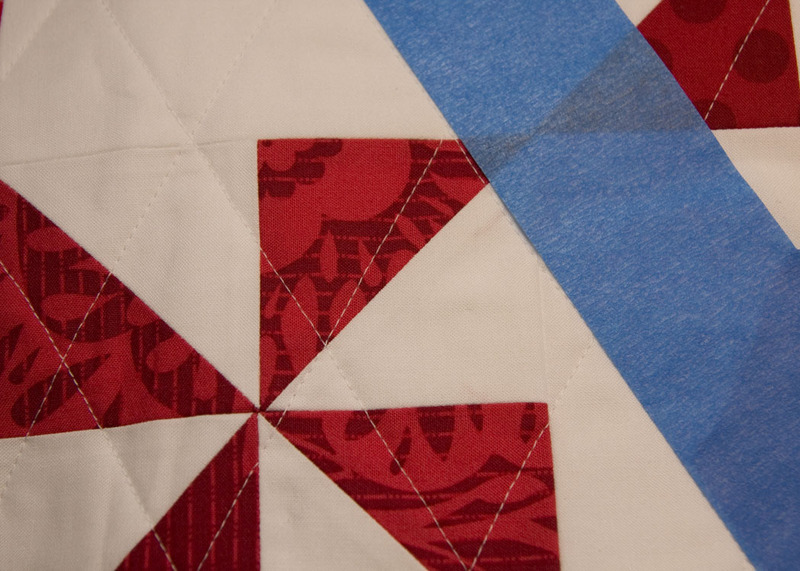 I then spaced my quilting using wide painters tape to mark my lines. I added the binding using a about a 3/8" seam allowance to give a wider binding. Stitch onto table runner using a walking foot. When you get to the end, it's unlikely the colored stripes will match perfectly. Mine ended almost exactly at a seam. I could choose to match two red sections or two white sections. I choose to match up two red sections to finish. Cut ends of the binding strips at a 45 degree angle and stitch closed. 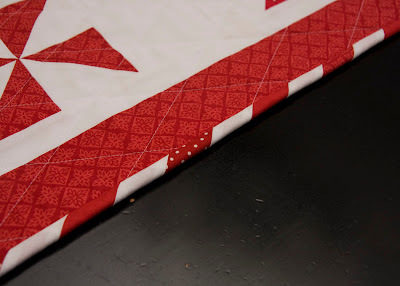 Finish stitching binding to the front of the table runner and attach by hand or machine to the back. Don't forget to check out all the other great tutorials going on this week! 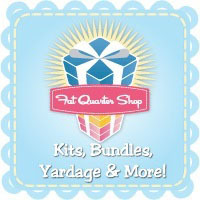 Win a $25 gift certificate to Fat Quarter Shop. I'll announce the winner, picked by Mr. Random, on October 26th. Leave a comment telling us your favorite thing to give as a homemade gift. We can always use more great gift ideas. Please make sure I have a way to contact you. Don't forget Jennifer's giveaway as well. Head on on over to Ellison Lane Quilts to enter to win a $250 gift certificate to Fabricworm! And just for stopping by, you can take advantage of a generous 15% off discount at Fabricworm with the coupon code fw12days through the end of the blog hop. Love the pinwheel table runner. The candy cane binding is a great idea. I've mostly baked cookies as homemade gifts, but last year I made mug rugs for all my co-workers. Thanks for the giveaway. I love your table runner! I think it would make a great wall hanging too, easy to adapt to a different size. I love to make little zipped pouches for friends - we can all use them! I love to give homemade cakes! You've just finished the Argyle QaL and off to the next tutorial = GREAT. I love your runner. It is amazing. I have just the place for this. My favorite thing to give is handmade ornaments. It will last them forever and every year they can think about the year they got "this" ornament. Thanks for sharing. This is a lovely idea and looks so fresh! Thanks so much! I love to give selfmade jam with a special touch (like unespected spices ...). Love the candy cane binding idea! I have only ever given away quilts as handmade gifts...not too creative but the recipients appreciated them I think! Pencil rolls are a great gift for children and those who love to draw and doodle. Love your binding. I love the candy cane binding. I love to give snowmen wall hangings, they always seem to bring a smile to my face. I love the tablerunner, thanks for the tutorial! I like to give zipped pouches with a goodie inside. I've been watching the draft and I would like to make Christmas gift for everyone, are very good ideas! I love fun bindings! My husband made cutting boards out of hardwoods with quilt block patterns for gifts last year. They were a HUGE hit. Awww, I love the candy cane binding!!! So cute!! Lovely binding! I like to give homemade biscotti at Christmas - wrapped up in starry paper to look festive. Good for dunking in coffee! This is adorable. I am going to try the pin wheel for the first time today on a thanksgiving quilt. Such a pretty table runner!! I love it especially the candy cane binding! Before this year, my favorite giftie was a knitted scarf. This year, I think it may be pouches. Thank you for the tutorial - the binding really tops off this table runner. This year my favorite gift is a log cabin quilt for my son and daughter in law....black and white with red centers. My favorite gift is to give a "Bag Kit" - some material, a pattern and the cotton etc - then my friends can enjoy making stuff too. 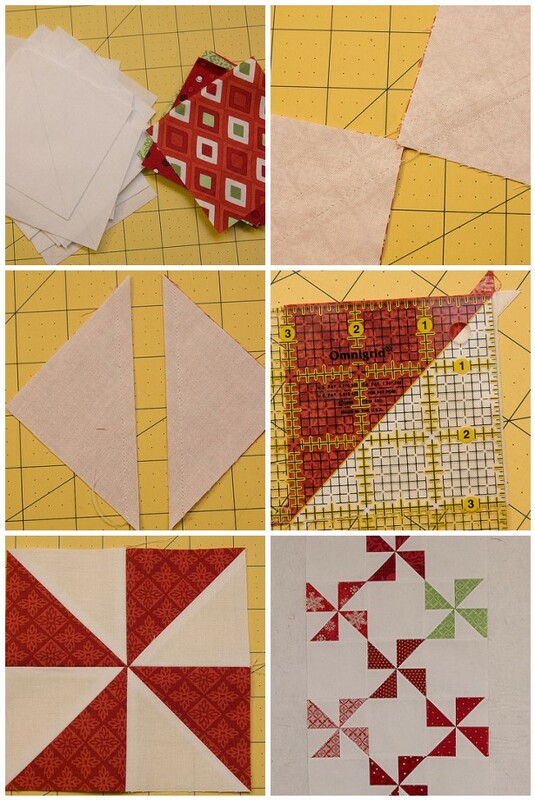 Thank you for the tutorial.....the table runner will make a 'few' awesome Christmas gifts. Luv luv luv pinwheels and your binding is perfect. My favorite gift to give is a lap size quilt. With 3 weddings this year I have been busy. I also like to give a 'quilt kit' to my quilting friends and family. My goal for Christmas this year is 'handmade'. cute! I love that you made that candy cane stripe! Lovely tablerunner and great tutorial! Many thanks! I have always loved the look of pinwheels and your tablerunner is just wonderful. My favorite thing to give are small wallhangings, tabletoppers and purses. Depends on who they are going to. Loving the blog hop too. Thanks for the wonderful tutorial. I don't have one specific thing to make as gifts. It all depends on the the recipient. Thanks for the opportunity to enter your great giveaway! I LUV that candy cane striped binding! One of my fallback gifts is the handmade napkin set tutorial from Film in the Fridge - it's a great way to be green AND bust through some stash! Thank you! I have been wanting to do my kitchen for years in peppermints and candycanes. I LOVE the binding, would have never figured that on my own. You rock! My favorite handmade gift to give - every year I make my 4 nephews and my son pillowcases with their names embroidered on them. I don't know if they like them or not. I seem to be on a bit of a chenille blanket giveaway at the moment. I also like giving away things I have canned, like jams and jellies. I love your tablerunner. The binding is so perfect!! And my favorite thing gift to make is actually a tablerunner. I have a pattern that I love and makes up beautifully. Thanks for the tutorial and the giveaway. Thank you for the tutorial; my LR and DR are red & white so it's perfect. Usually I combine a sewing gift with food. When I was working, the best gifts were baked gifts, casseroles, etc. as it gave me the best recipes and time. A good gift for someone setting up a household is holiday decorations. I did this for my sisters when they got married. I started a long time in advance, and bought holiday decorations through the year. Often I could buy them just after a holiday passed so they would be on sale. When my sisters' bridal showers rolled around I had a collection of decorations for the whole year's holidays. I wasn't as crafty back then, but if I did it now, I would also make some tablerunners and other decorations for the collection. I love giving jam-- I made 50-some flavors last year and gave away extras as gifts. Love the table runner ... my favorite thing to give as a gift is usually a simple tote bag! stitches up fast & easy and can always be the 'gift bag' for another item. Thanks! The binding is fabulous. And perhaps, not so daunting since it is for a smaller project. It all looks good!! Love the table runner- so cute! I like to give ornaments for Christmas gifts. That is some fabulous binding! Wow! I like to give pillows. I love to give potholders away! ThaNks so much for this great tutorial, especially the binding tips! My favorite holiday gift is to make biscotti, using Julia Child's yummy recipe. Besides quilts, I love making tablerunners & table toppers so they are my go to gift. They are so versatile - lots of patterns and color & fabric combinations. Yours is already in my favorites - thanks! My favorite handmade thing to give away is a quilt - so I'm kind of limited as to how many handmade gifts I can do in a year! Maybe I need to think smaller..... ;-) Love your table runner!! oohhh.. candy cane binding! love it. I actually don't give a lot of handmade gifts for christmas. Though I think I'm doing tote bags for my daughters teachers this year. Guess I better decide soon? So cute! Jen at In Color Order has a really cute small bag tutorial. I'm going to use it as the gift bag and put some small goodies inside. Thanks! I love this! I need to make this binding for my Christmas quilt! I love the runner - especially the binding! This year I'm making lots of damson gin!! Very sweet table runner. I love all the white and the touch of light green! Thanks for the tutorial! Thank you for the tutorial. Pillow cases are my favourite hand made gift. I also like to receive them! Omg Kati. The binding is fantabulous! This christmas I'm planning on making peppermint footscrub for all the ladies on my gift list. Last year I made pot holders which everyone loved! I absolutely love that candy cane binding, such a neat idea! My favourite hand made gift to give is a scarf or a shawl. You can't beat a nice knitted lacey scarf as a christmas present! This is such a great tutorial- can't wait to make one! I like to give homemade cookies since they're easy to whip up when you're short on time. This year I'm going to try to make more sewn handmade gifts though! Love the binding idea! I'm the official cookie baker for the family so I'm always looking for a special way to package the treats, something that the recipient can use long after the goodies are gone. The fabric boxes from Pink Penguin's tutorial will probably be my container this season. I also make a lot of pillowcases and use these to wrap gifts for the children. This is a must make table runner. I love to make ornaments from pine cones to give as gifts. Cute runner. I love to give away food or baked goods. I love to give quilts! but that's not really practical for more than just a couple gifts. I think this year I am going to do some placemat sets. Cute table runner, Katie :) We make homemade chocolates to give away each year. So yummy!!! What a great tutorial. Your table runner is lovely! These days my go-to handmade gift is baby quilts for all the mamas-to-be in my life. 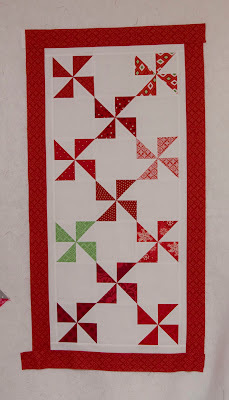 Pinwheels are my absolute favorite and with that candy cane border they are quite festive for Christmas. Thanks for the great tut! I always try to make something different each year. I've done coasters, potholders, table mats, mug rugs.....I think this year it will be vinyl zippered pouches. This runner is beautiful and the binding is adorable.Well done!!. I make boats o, stars, mugs and table mats. Love this runner..on my growing list! I am hoping to get some pouches made as gifts this year, Thanks for the opportunity to win. Great tutorial! Love to give away muffin mixes, but since I am a newer quilter, my new neighbor giveaway present will be mug rugs with a mug and some hot chocolate! love that runner! my favorite thing to give as gits are throw pillow covers - they can be easily customized and look so fancy - they get a great reaction from kids to adults! What a cute little project! I love it!. The candy cane binding really sets it off. I love giving quilts, of course, and table runners as gifts. We usually give the teens & young adults on the list movie theater gift cards. The teens look forward to it each year. I love this candy cane binding! It is totally adorable! We all enjoy looking at the pictures and I get the fun of reliving each event as I scrapbook them! My favorite homemade gift to give away is a quilt. Oh my, I just love your runner and the binding is super cute. Love the binding on this!! My favorite homemade gift to give would be a quilt but potholders are always a quick nice gift to give too. Beautiful table runner. I don't usually give handmade gifts, unless they are cookies, but now that I am learning to sew I like the idea of table runners. I like to give self-sewed CD-Organizers or pouches. Pinwheels are so versatile - cute binding. Bread - usually pumpkin or banana. However, I've made lots of totes, purses, quilts, etc., customized to the recipient. I love this runner. I will definitely make one this year, but I will probably keep it for myself! I usually bake for my neighbors and family during the holidays, but this year they might get pillows. Very cute table runner!! I love to give bags, they usually they go together pretty quick and you can never have to many bags!! Thanks for the giveaway!! great tutorial--the binding really makes the runner "pop"! I love giving people quilts. I love seeing their face when they open the corner to reveal the while pattern...precious! I love to give quilts. Or softies. I love to give friends and neighbors home made cookies. Cute runner! This is just darling! Great tutorial too. What is your border/binding fabric? It's just perfect! This is so cute. I like to get my family their Christmas gifts by Thanksgiving too. I usually have something in there that they can use for the whole season. I like to give things that I *know* will be used...zip pouches to tame the handbag chaos, potholders and whatnot...too many times I've put in so much work on something only to discover that the recipient is a little overwhelmed by the gift and doesn't want to use it..so it stays in the closet and gets dusty. I love to give zipper pouches! I love giving quilts. Everyone loves a quilt to cuddle with on Christmas morning. Right now, I'm loving giving mug rugs. I give my 3 yo some white fabric and THE BEST fabric markers around, Crayola Fabric Markers, and let her color to her heart's content. Then I heat-set the coloring, and put it together as a mug rug. Her teachers really loved them the first day of school, and I know the family will love them at Christmas. This year I am thinking of making a fabric Christmas Card holder. Well I know this year my favorite handmade thing I will give will be pouches, and I am even going to try making oilcloth ones! Favorite handmade gift? Tough. I think this year it will be mug rugs. I made a couple for Swap Bot a couple weeks ago and I love them! So for all the aunts and uncles and Cousin Suzie we are going to buy mugs at the local Potter's Guild show and I am going to make mug rugs that match. As soon as I saw the pinwheels written in your post, I knew it would be something I want to make. ANd I always love a striped border. I just love the table runner. SO cute. My favorite thing to make for others are wall hangings. My kids want one for each season so I am always making them something. I also like to make zippered bags and coasters. I haven't made any for a while so I guess I better get busy. Thanks for the instructions on the table runner. I want to add it to my pile of things to do. i love handing out baby quilts to new parents. Thanks for the pattern, so cute. My favorite thing to give homemade wise is a jar of homemade jam and a potholder to go with it. Quilts are my favourite handmade gift to give away but they are expensive to make so I don't get to do them nearly as often as I would like. My most frequent handmade gifts are knitted scarves. They aren't my favourite but far less costly. Right now, I am working on making a Remembrance quilt using Papa's clothes. I'll be giving it to Grannie. They were married 57 years and he suddenly passed away on August 27th. My hope is that the quilt will give her something special to remember him by and maybe help her heart heal just a little bit. Wow - I love this little project. Definitely on my to-do list now! love the candy cane binding, it just makes it so Christmassy. I love to give the scrabble pendants as gifts, they are so easy and go over so well. 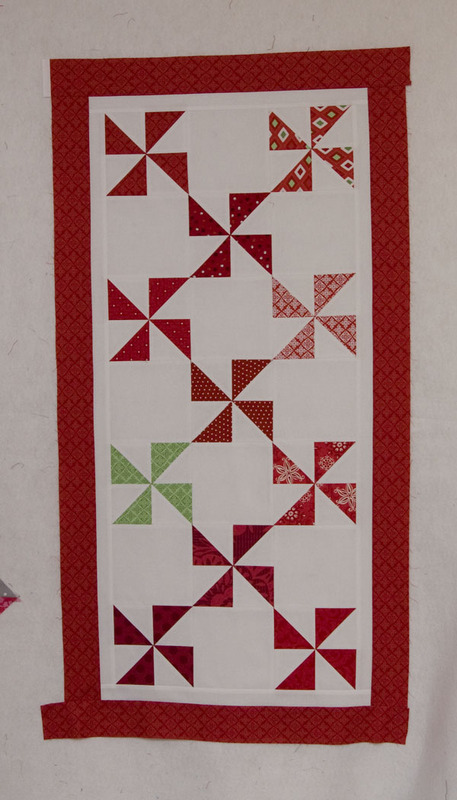 Your pinwheel runner is great, and fits right in with a favourite gift to make and give - table runners! The table runner is beautiful, thank you. My favorite items to give away as gifts are pillowcases. Having teenagers, this has proven to be the best gift, especially when they are able to pick out their own colors. I love the striped binding ... great tutorial. I need to make a kitchen table runner for my table! Hi I like to make margo purses for my family and friends and little snappy cosemetic purses I like your tablerunner. I also make placemats and table runners for myself and friends I like this idea for the candy cane binding. I love this table runner and will try and find time to make this for the holiday season!! Maybe I will make a couple to give for gifts also!!! I love to give homemade baking! What a great table runner! Love it. And the perfect binding. This year I'll be making Christmas potholders for my friends as Christmas present. Simple, quite fast to make and can always be used! Thank you for sharing your tutorial with us! Last year was my first handmade gift giving - I made two table runners. It was fun, but not an ideal last minute gift if you've never quilted before! Talk about stress! But, with a year under my belt, I'm feeling much more prepared for making things for more people! Thanks for the tutorial, this looks perfect! Oh goodness, that binding is genius!! I can't wait to give it a try! I really don't have much time to do homemade during the holidays, so I usually just go with cookies. Maybe next year I will work on more gifts from the heart! What a cute idea! I love the way you made the binding. I suppose the technique would work for all sorts of stripes if you didn't have a stripe print. I really love this table runner. The binding is perfect. I have this on my list for sure! Nice tutorial. I like making hand-knit socks but they take quite a bit of planning to get done before Christmas. Last year my dad got one sock on Christmas Day and had to wait for the other a week later. Cute table runner! 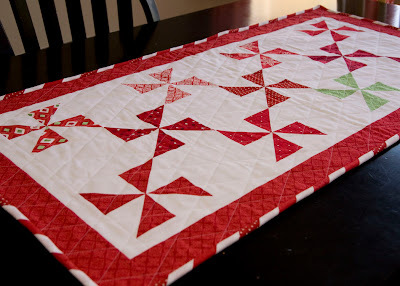 I made a red/white string quilt last year that I couldn't part with - this table runner will go perfectly! My favorite gift to give is a small crochet bag that has a ribbon "drawstring". Easy to fill with a couple of yummy chocolates. 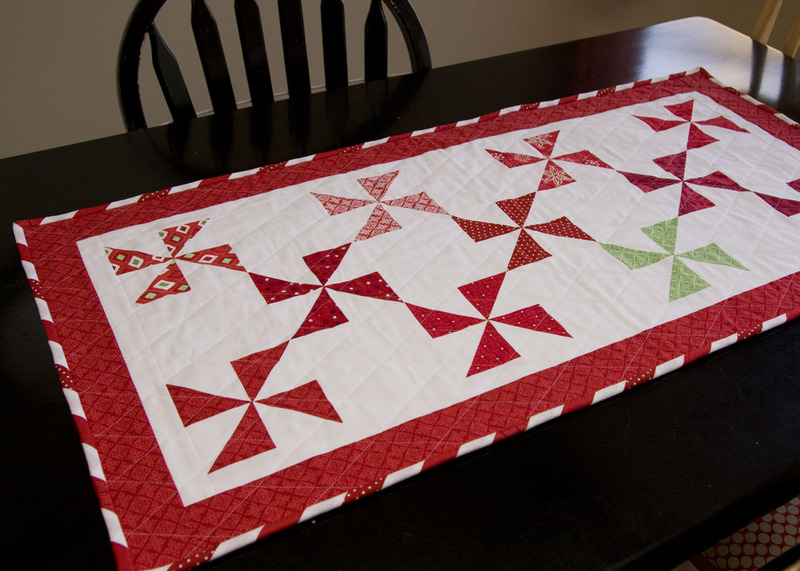 That green pinwheel just makes this table runner "sing". I love a striped binding, but I use preprinted stiped fabric cut on the bias. As to homemade gifts, I have given success with a plate of cookies all the way to a queen bed quilt. Mt favorite gift to give away is not a sewn item, but homemade jam or jelly. But since I am into making pouches, purses and bags lately, lots of people are getting these for Christmas this year. Love the binding on your table runner! For baby gifts, I give a flannel recieving blanket, some burpcloths, and bibs. The candy cane binding is really cute! i love making sets of coasters or napkins for little gifts. thanks - i love those pinwheels! This is going to be one of my favorite tutorials of the 12 gifts of Christmas! I love to make a quilted gift when possible. 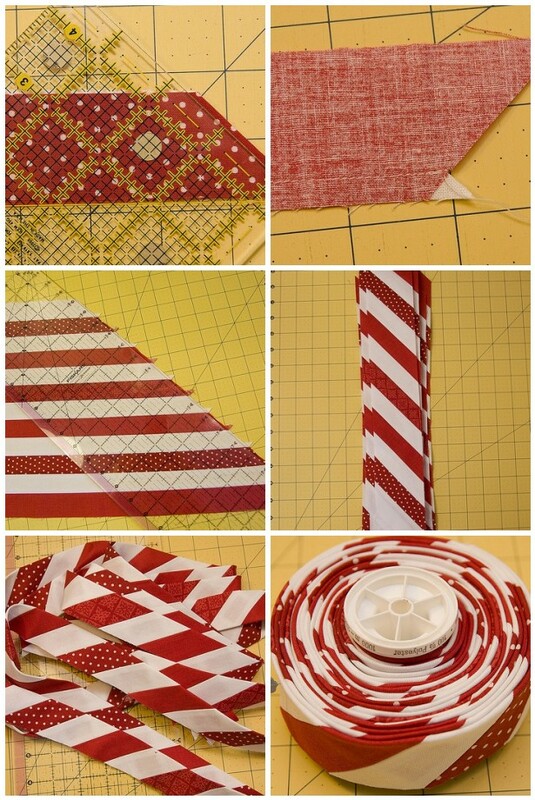 Your table funner is very sweet, the pinwheelis my favorite block, and I do love the candy cane binding - great idea! Pretty. My fav thing to give is yo yo's candle mats. In the past my favorite homemade present has been my zucchini bread but I'm hoping to actually sew some presents this year! I love the runner, I want to make some now. Thank you for sharing. I love the pinwheel table runner. The candy cane binding really pops. Thanks for the great tutorial. I'm going to have to make myself one of these & some for others. Last year I made fabric shopping bags for my family that folded up into the pocket. They loved them. I am finding all kinds of ideas for them this year on this blog hop. Thank you for the great ideas & tutorials! in the past handknit hats were one of my favorite gifts to make, but this is the first christmas i've really known how to sew, so i hope to make some different things this year. JUST LOVE THE PINWHEEL RUNNER! THE PINWHEEL WAS ONE OF THE FIRST BLOCKS I TRIED! STILL LOVE HOW IT LOOKS>SO FRESH+BRIGHT! THANKS FOR SHARING! My daughter makes awesome peppermint bark. We love to give it out at Christmas to friends. I especially love it cause she does the work and I get the compliments! My fave gift is a "Cuscion" or a "Potholder"
So cute and I LOVE that candy cane binding! Love that binding! I always try to work with stripe fabric for my bindings - never thought of making my own stripes and believe this will now be the way to go. I either knit (hat-wrist warmers, etc. ); cross stitch; sew (table runners/covers) or bake something for Christmas. Seems anything homemade thrills the recipients. Thanks for a new idea. I have struggled with trying to find a way to do 'barber pole' binding!! This is perfect! Great runner! Any homemade gift works for me, but I love handy small gifts, like potholders. Sorry, I don't have any new ideas, just wanted to say I love the table runner. I usually make each one in my family a new table runner, either for Thanksgiving or for Christmas, every year. I love to give handmade journals! I can't think of a better way to keep up with what happens in my life! Thanks for a great tutorial! I love the pinwheels! The border just tops it off! Love the pinwheel table runner. The candy cane binding is a great idea. I like giving the recipes in a jar. but this year I'm going with mug rugs. Thanks for the giveaway. thanks for the cute project - it looks fun to make. My favorite homemade gifts are usually from the kitchen - pumpkin bread, homemade jams, cookies. People really enjoy those gifts! Great table runner, I love the reds and white together! I like to make small quilted projects like little festive wall hangings or table mats. Thanks to the chance to win! Lovely table runner. I love to make and give cloth napkins for gifts. Easy to make and everyone loves them. Thanks for the giveaway. Thanks very much for the binding tutorial. I like to make brightly colored luggage tags for gifts. And also tote bags, because there is such variety in style and color. Lately I've been making large liberated wonky log cabins blocks and using one block for each side of the tote bag. These totes are very eye catching. Thanks for the giveaway; winning would be a real treat. Love your table runner. The striped binding is lovely. I added a striped piping to some Christmas stockings I made for grandkids and thought the stripes turned out so well. I actually purchased a red/white striped fabric but your binding system could be utilized in many colors for lots of different looks. Favorite gift is the Christmas stockings I make for my grandkids. Super sweet table runner! Love the peppermint stick binding. The one gift I like to make time and again is one of my fold'n roll shopping bags. Wow! I love the binding. That is a labor of love! Perfectly beautiful! One year I made homemade chocolates and candy, but that wasn't good for my waistline - I couldn't give them the ones that didn't turn out, could I? Rice bags to use as hand and feet warmers are some of my favorite and easiest things to make. Favourite thing to make as a gift - cushions! That binding is awesome! It just gives the perfect finishing touch. I tend not to give sewn gifts but I love to give jam, often with a batch of bars or cookies (& the recipe) that use jam as an ingredient. See, I love to make jam but don't really like to eat it! I like to give whatever little bag I feel like making at the moment. :) Thanks for the tutorial and giveaway! Adding the green pinwheel is my favorite part, oh, and the candy-striped binding! Ok, you get a gold star for actually piecing that binding!! I'd be shopping for a stripe, myself! I love giving small pouches or wristlets with a giftcard, but this year my nieces and nephews are all getting TV/reading pillows! I love the tablerunner but the binding is just the bomb! Thanks for the great tutorial! Scarves! They're so easy and perfect for the season. Obviously I love giving quilts but that is pricey and not appropriate for all. The Mr. and I love to make mixed veggie pickles and those go over very well! We love to give cookies and fudge to the neighbors!! I LOVE this project! So cute! We make cookies for acquaintances/colleagues and would love to have something cute to package them in. I also have a lot of girlfriends ask for pot holders and/or trivets. New ideas there would be helpful as well. :) Thanks for sharing! This is boring, but I do love to give quilts. The other thing I like to give is a good book. Thanks for the giveaway. LOVE that binding!! Such a good idea, just a little jealous that I didn't think of that!! Great tutorial Kati, definitely going to have a go at some candycane binding thats fab! how cute, and i love that binding!! That candy cane binding is such a cute touch! My favorite thing to give as gifts so far are quilts, but they can get expensive and time consuming so I'm always on the lookout for other ideas. I'm looking forward to reading through your comments to find more! I enjoy giving quilts for unsuspecting friends and bundles of fabric for quilty friends. Your table runner is really cute and the binding is fantastic! I have made many gifts. Over the years, I have given knit scarves, handmade pillows, cosmetic bags, small wall quilts, fleece hats and scarves, and cross-stitched ornaments. Really cute, especially the binding! Thanks for the tutorial. great tutorial=thanks! my favorite gift to give is a patchwork potholder with some home canned item. thanks for the giveaway! Love the runner tutorial! I love pinwheels! Thank you for posting...I have some fabric that will work just great for this. I love to give anything homemade...blankets, aprons, rice bags, anything that makes a person happy. I make tote bags, walker bags, and wheelchair bags for my group, World of Charity Stitching; they are donated to a senior citizen center and a domestic violence shelter. My favorite holiday gift seems to change to whatever is the latest trend that year! For quilt-y friends I like to make a finger pincushion from a plastic bottle cap. I've made homemade beer nuts or a soup mix and put them in a cute, decorated class jar. I also like to make hand warmers with corn inside. Thanks for the chance to win your giveaway. I just love that binding and it was easier than I thought it was going to be! I love making lap quilts to snuggle under as gifts. cute runner and love the candy cane binding! have made various small projects for gift, my fav to make: mugrugs! but now, i'll make some runners with candy cane binding! thans for the grea tutorial! Love the table runner and the binding is just so cute! I like to give my cross stitch items for gifts. Last year I made kids' teachers hot chocolate on a stick and gave them each a personal mug to go with it. I guess teachers probably have too many mugs but I'd LOVE to get that as a gift! I think I will use the idea for the border in a quilt I'm planning to make. What a great idea, thank you for sharing it. A question, can someone tell me what WOF means (I am a beginner)? You can't go wrong with pinwheels. One of my favorite blocks. Love the candy cane binding. I like to give pillows especially when I know what colors a person uses in their home. I like to give table runners as gifts, there is always a place for one. Cute table runner. I like to fix up a basket of homemade candies and cookies to give as a gift. I always do this for my Grandpa and Grandma (because they have everything) and for my kids teachers. Great tablerunner. Love the one green pinwheel! RINEKE (I hope this catches your eye): WOF means width of fabric, usually about 42 inches. My favorite homemade gift to give is a quilt. For less time-consuming presents, I like to make cherry stone heating pads, pieced table runners, or wool pin cushions. 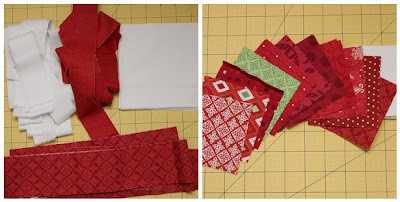 Lovely tablerunner kati and the candycane binding is such fun - thanks for an awesome giveaway! This will be the first year making and I really want to make my Godson a quilt. Lovely! I think I can see one of these in my future! I'm so into striped bindings. Love the candy cane take on it! What do I like to give as handmade gifts? Probably scarves and baby quilts are the ones I give most often. mostly i do chocolate covered oreos for 'handmade' gifts. thanks for the chance to win! Love that binding! One of my favorite homemade gifts to give (besides food!) is a handknit washcloth with some luxury shea butter or goat milk soap. They knit up so fast and are great to use! i'm boring - I usually just make up several of the canning jars filled with dry ingredients to make cookies. I love giving homemade gifts. My favorite last year was homemade vanilla extract. But sewing wise I've enjoyed making toys like patchwork balls or little dolls. This is an adorable runner! Love the binding! I love making quilts to give or knitting of some kind. I love to give homemade potholders and chocolate zucchini bread. I usually make tablerunners as gifts - they're fast enough to make several without killing myself and can easily be "individualized" for the recipient so the gift still feels unique. Homemade Chocolate Pie or Peanut Butter Candy from Mom's recipes. Firstly - I adore that candy cane binding!! Thank you for such a great tutorial! I believe I will be using this technique in the near future. Secondly - I am only getting started in the homemade gift giving. But thinking back, I think I most like to give away stuffed animal type things to kids. I made a few alien dolls this past year and they have been well received! I love to make dolls and soft toys to give to the kids in the family and I've also made Christmas ornaments that were a lot of fun to make.